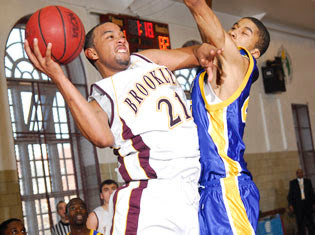 The Brooklyn College Bridges were upset by the City Tech Yellow Jackets, 88-78, on Saturday afternoon at Roosevelt Gymnasium in the CUNYAC Men's quarterfinals match-up. Omar Mahoney, a guard off the bench for City Tech, was the difference in the game. Mahoney scored 31 points overall, including 23 in the first half. It was Mahoney's three point shooting that spurred a 17-1 run by the Yellow Jackets which the Bridges were never able to recover from. Going into the game, Brooklyn was focused on stopping City Tech's pair of First-Team All-Conference players, Jamaal Hall and Ryan Phillip. They were able to do so early, as Brooklyn had a 19-10 lead at the beginning of the game. City Tech was able to quickly adjust to the double-team the Bridges had on Hall by dishing the ball to the open man, which was often Mahoney, who went 5-6 from behind the 3-point arch. It wasn't long before Brooklyn was down 30-20. At this point, a McFarlane steal seemed to turn the momentum back for Brooklyn. CUNYAC's Player of the Year, Jean-Baptiste, scored four points over the next minute to the Bridges within four, but that would be as close as Brooklyn would get. City Tech finished the half up 47-34. The Bridges got off to a good start in the second half with a 7-2 run that brought them back within eight. Then City Tech seemingly took the life out Brooklyn's offense with a three point shot by senior LaShawn Doyle, which pushed the deficit back to 11. The game seemed like it was all but over with 4:31 left. after Doyle hit a free throw to give the Yellow Jackets a 17 point lead. Then Brooklyn College fought back to bring the game within single-digits, but with just under a minute left to play, all City Tech had to do was run out the clock. At this point all the bridges began to get desperate. They resorted to forcing plays and fouling opposition players. Jean-Baptiste was the game's leading scorer. He picked up 32 points and had 12 rebounds. McFarlane, who won the CUNYAC Championship as a member of City Tech in 2005, fell just shy of a triple-double, scoring 23 points while picking up 12 assists and 9 steals. Hall was able to come away with a triple-double for the Yellow Jackets. He scored 14 points with 13 assists and 10 rebounds while playing all 40 minutes. Phillip was also a big contributor, scoring 21 points with 14 rebounds. It was the third matchup of the year for the two teams. City Tech took the first game behind a strong performance from junior Hall, who scored 39 points, and Brooklyn College took the second game by 19 points. City Tech will continue on to play John Jay in the CUNYAC Semifinals Tuesday night at 7:30 PM.